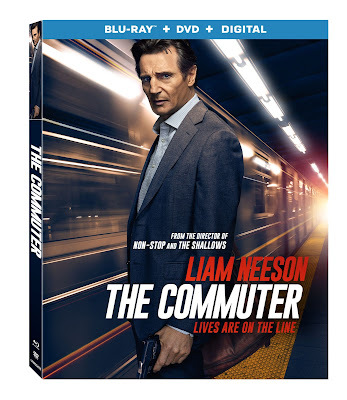 Mega-action hero and Oscar® nominee Liam Neeson (Best Actor, Schindler’s List, 1993) proves that no one gets hurt on his watch in The Commuter, arriving on Digital April 3 and 4K Ultra HD™ Combo Pack (plus Blu-ray and Digital), Blu-ray™ Combo Pack (plus DVD and Digital), DVD, and On Demand April 17 from Lionsgate. Time is ticking as Michael (Neeson) gets entangled in a deadly conspiracy on his daily commute that forces him to work against the clock to protect the lives of his fellow train passengers. The edge-of-your-seat action thriller also stars Vera Farmiga (The Conjuring, The Departed, TV’s “Bates Motel”), Patrick Wilson (The Conjuring, Insidious), Jonathan Banks (TV’s “Breaking Bad,” “Better Call Saul”), with Elizabeth McGovern (TV’s Downton Abbey), and Sam Neill (Thor: Ragnarok, Daybreakers). Michael’s (Neeson) daily commute home quickly becomes anything but routine. After being contacted by a mysterious stranger (Farmiga), Michael is forced to uncover the identity of a hidden passenger on his train before the last stop. As he works against the clock to solve the puzzle, he realizes a deadly plan is unfolding and is unwittingly caught up in a criminal conspiracy. One that carries life and death stakes, for himself and his fellow passengers. From Jaume Collet-Serra, the director of Non-Stop and The Shallows, and written for the screen by Byron Willinger, Philip de Blasi, and Ryan Engle, The Commuter’s home entertainment release includes two never-before-seen featurettes that focus on the cast’s experience shooting the film and the technical details of shooting on a train. The 4K Ultra HD and Blu-ray versions will also feature Dolby Atmos audio remixed specifically for the home-theater environment, to place and move audio anywhere in the room, including overhead. The Commuter will be available on 4K Ultra HD Combo Pack, Blu-ray Combo Pack, and DVD for the suggested retail price of $42.99, $39.99, and $29.95, respectively.